A little over a month ago, I blogged about this Catholic Answer’s radio show featuring Chad Judice as the guest. If you recall, his son, Eli, was diagnosed with spina bifida and wasn’t expected to live or have good quality of life. 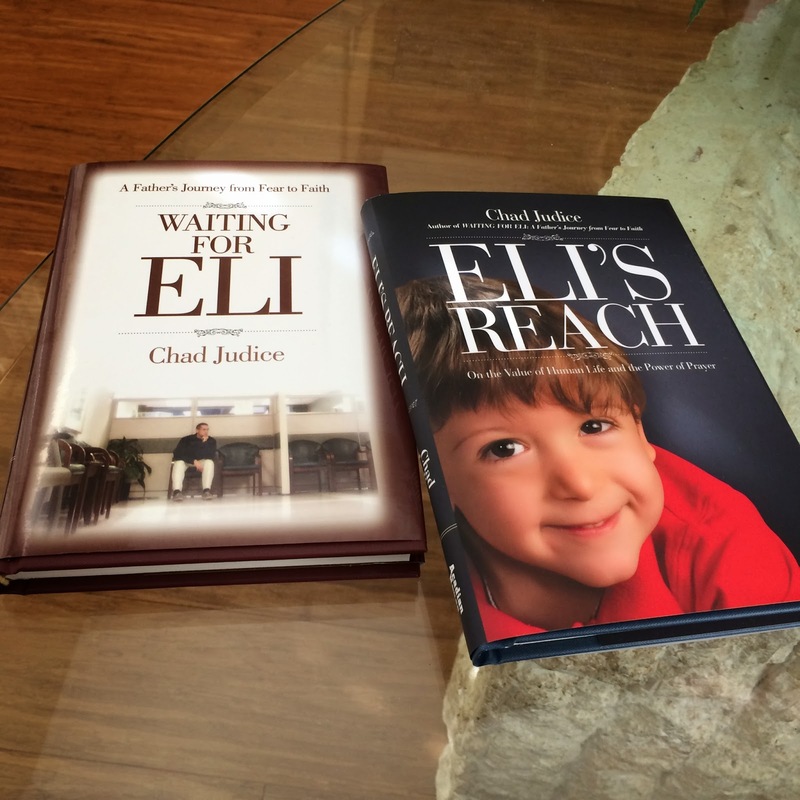 As I heard Chad talk about this story regarding on his son on the radio, I was inspired to hopefully read Chad’s books regarding Eli someday. Well, I didn’t mention it after I had written that blog post, but literally the following week I found out my parish’s Respect Life Committee would be hosting Chad Judice at our parish in the month of November to kick off their new series of events entitled, “Fridays for Life”, where they will invite someone every quarter to talk about pro-lifey things. Like, I had no idea that they were planning on inviting him! So when I found out he would be coming to my parish to come speak, I couldn’t pass up that opportunity. And that happened the other day! Even though I had heard the basic gist of Eli’s story via that radio show and a little bit from Chad’s EWTN appearance on The World Over, it was definitely more gripping to listen to him speak in person. He shared with us the state of his life prior to Eli and how normal it was. He’s a history teacher and coach, and one time one of his students asked Chad before he got married what his greatest fear was, and he answered with having a child with special needs. Before Eli, Chad’s faith was meh. After giving us this background, he began to recount the process of how he and his wife found out about Eli’s condition with spina bifida. Their doctor recommended abortion and for a moment, she considered it. But something stirred within them to decide to keep the baby. The parts of the entirety of the story that stood out to me were those seemingly miraculous (or coincidental) moments. Chad teaches at a Catholic high school, and it was miraculous to him that hundreds of teenagers genuinely prayed for Eli’s healing. This was miraculous to him because our culture today doesn’t make it conducive for the average teenager to care about this sort of thing, AND the fact that they prayed showed him that they acknowledged that Eli is in fact a human being in his mother’s womb and not just a clump of cells with deformities. What I also found quite interesting is how the Daily or Sunday Gospel readings over the course of this process seem to fit soooooo well with whatever Chad was dealing with at the time. He shared with us those readings that were cause of hope and inspiration for him at major milestones throughout this process. Chad also detailed how his life of prayer increased in dealing with all the emotional and spiritual challenges in accepting the fact that his son isn’t going to live a normal life. He provided more seemingly miraculous moments when praying at the grave of Charlene Richard, who is on her way to beatification. Chad and his wife went to a “healing priest”. His wife received a rose after praying a novena for St. Therese of Lisieux’s intercession, which for every knowledgeable Catholic, that’s a real deal. And he listed many more instances of how God seemed to have offered him and his wife consolations in their decision to have Eli, but not without challenges. Eli was born in 2009. Despite spinal and neuro problems from his condition, he’s doing pretty good. He cannot walk. He cannot go to the bathroom on his own–someone else has to manually empty his bladder or induce a bowel movement. He’s on medications to prevent epilepsy and urinary tract infection. He loves to swim. He loves baseball. He’s pretty cognitive despite brain problems. He’s in pre-3K. It takes full effort from everyone around him to take care of him. Chad mentioned that his in-laws and his own parents are pretty involved in taking care of him and are on rotation for weekends. I think spent 75% of the time reminding myself not to cry. In my head, I kept saying to myself “Don’t cry don’t cry don’t cry don’t cry don’t cry!” I guess I was just moved by Chad’s inner strength at dealing with all this because I realized that if I were in his shoes, I don’t think I could handle it. But that’s where his story is inspiring. Chad couldn’t handle all this on his own. He realized he had to surrender to God’s will, and in doing so, he found the strength to endure this. He also realized that he can longer live for himself. That whole idea of agape love (self-sacrificial love) made manifest in caring for Eli, because without the love and care of others, he would die. But to care for him demands so much time and effort, even if it’s inconvenient or unpleasant. Chad said, “love isn’t about feelings–it’s a decision.” And I see in the Judice’s lives that self-sacrificial decision to will the good of each other and the good of Eli, which is authentic, profound love. Inspiring! But yeah, I began to start reflecting on my own prayer life and thinking about my own inner strength while listening to Chad’s story. I realized that I have a lot to improve on. Haha sometimes I feel like I’m too Catholic in a group of Catholics, but I’m glad that I had the opportunity to listen to Chad to help me realize that I’m not Catholic enough…that I’m not trusting enough of God’s will for my life. After his talk and taking some questions, I definitely went and bought his two books. The first one, Waiting for Eli, is the story about Eli. The second one, Eli’s Reach, is about other people whose lives were affected by learning about Eli’s story. Like, seriously–stories of conversion and hope because they’ve read Chad’s first book. He gave us a preview at the end of the talk (ie. shameless plug, but that’s understandable). Fascinating! I hope to start these books sometime after I finish some of the current books I’m currently reading! Anyway, what a cool opportunity to hear him speak. Please pray for him and his family, especially for Eli! You can follow Chad Judice at www.chadjudice.com, which has links to his social medias and books. We need stories of hope and inspiration, and be reminded that there’s only so much we can do and control. The rest is up to God. And I’m glad I had the opportunity to hear Chad tell this story in person.